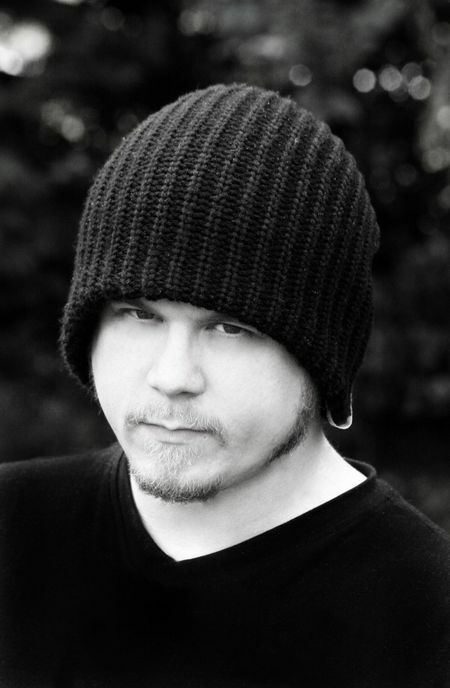 Aaron Dembski-Bowden, auteur du roman Le Premier Hérétique, vient de mettre en ligne ce matin, sur son blog, le prologue à son prochain roman, initulé Void Stalker, qui ne paraître qu'en mai 2012 en anglais ! As requested by a bunch of people (when I offered on Wednesday), here’s the prologue to Void Stalker. As you may have guessed from Soul Hunter and Blood Reaver, things aren’t going First Claw’s way. Behold, the beginning of the inevitable conclusion, and please remember that this is a first draft – essentially unchecked – and it may never appear in the final novel in this form. It probably will, though. I’ll just catch any typos and sentences I’m not keen on before then. THE PROPHET AND THE murderess stood on the battlements of the dead citadel, weapons in their hands. Rain slashed in a miserable flood, thick enough to obscure vision, hissing against the stone even as it ran from the mouths of leering gargoyles to drain down the castle’s sides. Above the rain, the only audible sounds came from the two figures: one human, standing in broken armour that thrummed with static crackles; the other, an alien maiden in ancient and contoured war plate, weathered by an eternity of scarring. The prophet didn’t answer. He spat acidic blood onto the dark stone floor, and drew in another ragged breath. The sword in his hands was a cleaved ruin, its shattered blade severed halfway along its length. He didn’t know where his bolter was, and a smile crept across his split lips as he felt an instinctive tug of guilt. It was surely a sin to lose such a Legion relic. The prophet sank to one knee, blood leaking from the cracks in his armour. His attempt at speech left his lips as a grunt of pain. The only thing he could smell was the chemical reek of his own injuries. The maiden came closer, even daring to rest the scythe-bladed tip of her spear on the wounded warrior’s shoulder guard. Talos spat blood again, and hissed two words. The murderess tilted her head as she looked down at him. Her helm’s crest of black and red hair was dreadlocked by the rain, plastered to her death mask. She looked like a woman sinking into water, shrieking silently as she drowned. The blade fell from his grip, too heavy to hold any longer. He stared at it lying on the black stone, bathed in the downpour, shining silver and gold as clean as they day he’d stolen it. Slowly, he lifted his head, facing his executioner. Rain showered the blood from his face, salty on his lips, stinging his eyes. He wondered if she was still smiling behind the mask. He was going to die here. Here, of all places. On his knees, atop the battlements of his Legion’s deserted fortress, the Night Lord started laughing. Neither his laughter nor the storm above were loud enough to swallow the throaty sound of burning thrusters. A gunship – blue-hulled and blackly sinister – bellowed its way into view. As it rose above the battlements, rain sluiced from its avian hull in silver streams. Heavy bolter turrets aligned in a chorus of mechanical grinding, the sweetest music ever to grace the prophet’s ears. Talos was still laughing as the Thunderhawk hovered in place, riding its own heat haze, with the dim lighting of the cockpit revealing two figures within. The alien maiden was already moving. She became a black blur, dancing through the rain in a velvet sprint. Detonations clawed at her heels as the gunship opened fire, shredding the stone at her feet in a hurricane of explosive rounds. One moment she fled across the parapets, the next she simply ceased to exist, vanishing into shadow. Talos didn’t rise to his feet, uncertain he’d manage it if he tried. He closed the only eye he had left. The other was a blind and bleeding orb of irritating pain, sending dull throbs back into his skull each time his two hearts beat. His bionic hand, shivering with joint glitches and flawed neural input damage, reached to activate the vox at his collar. Above the overbearing whine of downward thrusters, a voice buzzed over the gunship’s external vox speakers. Distortion stole all trace of tone and inflection. ‘Go, damn you.’ When he next glanced at the gunship, he could see the two figures more clearly. They sat side by side, in the pilots’ thrones. ‘You are formally discharged from my service,’ he slurred the words as he voxed them, and started laughing again. The gunship stayed aloft, engines giving out their horrendous whine, blasting hot air across the battlements. The rain steamed on the prophet’s armour as it evaporated. He drew in a knifing breath as he slumped with his back to the battlements, grunting at the stabs from his ruined lungs and shattered ribs. Grey drifted in from the edge of his vision, and he could no longer feel his fingers. One hand rested on his cracked breastplate, upon the ritually-broken Aquila, polished by the rain. The other rested on his fallen bolter, Malcharion’s weapon, on its side from where he’d dropped it in the earlier battle. With numb hands, the prophet reloaded the double-barrelled bolter, and took another slow pull of cold air into lungs that no longer wanted to breathe. His bleeding gums turned his teeth pink. Talos let the rain drench his upturned face, no longer gracing the gunship with even a shred of attention. Strange, how a moment’s mercy let them believe they could talk to him like that. He hauled himself to his feet and started walking across the back stone battlements. In one hand he held a broken blade; in the other, an ancient bolter. PS : des volontaires pour un traduction en français de texte exclusif ? Cela pourrait être intéressant si je comprennais mieux l'anglais. Voici la présentation officiel du roman Void Stalker, un roman inédit d'Aaron Dembski-Bowden qui sortira en anglais en mai 2012. ==> VOID STALKER d'Aaron Dembski-Bowden. Talos et le reste des First Claw/première griffes (je ne sais pas ce que c'est) continuent leur sombre chemin jusqu'à ce qu'il croise celui des Eldars. Le grand prophète du vaisseaux-monde Ulthwe prédit une grande menace en provenance des Night Lords. Il doit maintenant chercher à ramener les bobines du destin dans leur alignement avant que la prophétie ne se réalise. Avec la colère des Ancients avec eux, Le cœur lourd Talos mène une fois de plus ses guerriers au combat. Trop bien un prochain roman sur les Night Lords j'espère qu'il sera mieux Night Lord de Simon Spurrier. Un roman qui promet d'être sombre et tourmenté. In the years following the primarch’s death, more and more warbands cut loose from Tsagualsa’s skies and took their raiding deeper into the Imperium. Many were already carving out havens in the Great Eye with the other Legions, spending as much time waging war against former kin as against the minions of the False Emperor. A battlefleet of staggering size rested above the grey world’s barren face, each warship marked by the winged skull of the Eighth Legion. Here was a fleet that could devastate entire solar systems. It had done so before, many times. Across the Tsagualsan System, rifts in reality tore open in the silence of the void. They bled foul, daemonic matter into the clean silence of real space, while shuddering battleships strained their way back into the material universe. As with almost all warp flight, there was little cohesion, no alignment of arrival vectors and formations maintained through the rage of empyrean flight. Instead, one by one, the invaders burst from the warp and powered towards the grey world. At first, they matched the Night Lords’ numbers. Soon, they overshadowed them. As the battle began, by the time the skies of Tsagualsa started to burn, they eclipsed the Eighth Legion fleet completely. More warships arrived with each passing minute, vomited from the warp and streaming trails of poisonous mist. They needed no formation. They needed no strategic assault plan. That many ships needed nothing else to win a war. The Primogenitor Chapters, the Thirteenth Legion in all but name, had come to end the cancer of heresy once and for all. Un extrait du roman (en anglais) est maintenant disponible en ligne. Corax a écrit: j'espère qu'il sera mieux Night Lord de Simon Spurrier. Voici un essais de traduction d'une première partie. ça prends pas pas mal de temps, mais c'est sympa à faire. Le prophète et la meurtrière se tenaient sur les remparts de la citadelle morte, leurs armes à la main. La pluie tombait en un véritable torrent, assez fort pour obscurcir la vision, tapant régulièrement contre la pierre en coulant de la gueule des horribles gargouilles qui évacuaient l’eau du château par ses coté. Sous la pluie, les seuls bruit audibles venaient de deux figures, l’une humaine, revêtue d’une armure brisée qui vibrait, comme enveloppée d’électricité statique ; l’autre, une vierge extraterrestre équipé d’une tenue de combat au profil terriblement ancien, tannée par une éternité de coups et cicatrices. -C’est ici que votre légion est morte, n’est-ce pas ? Sa voix sortait déformée par le heaume qu’elle portait, émergeant de la bouche ouverte de son masque de mort de façon sibylline, comme fondant sous la pluie. -Nous appelons ce monde Shithr Vejruhk. Quel nom lui donnez vous, vous, dans votre langue de serpent ? Tsagualsa, non ? -Répond moi, Prophète. Pourquoi as-tu tenu à revenir ici ? Aucune réponse ne sortit de la bouche du prophète. Un filet de sang acide s’échappa de sa bouche et tomba sur la pierre noire du sol et il laissa échapper un autre souffle rauque. L’épée dans sa main était brisée, une ruine, coupée à mi chemin de sa longueur. Il n’avait aucune idée d’où pouvait bien se trouver son bolter, et un sourire apparu à travers ses lèvres fendues, comme il senti instinctivement de la culpabilité. C’était certainement un péché de perdre une telle relique de la légion. La maiden souriait en parlant, il pouvait l’entendre à sa voix. Ce qui était remarquable dans son amusement, c’est qu’il était dépourvu de moquerie et de malice. -Ne soit pas si honteux, humain, tout le monde meure un jour. Le prophète se mit sur un genou, du sang s’échappant des fissures de son armure. Ses essais pour ouvrir ses lèvres afin de parler le firent grogner de douleur.la seule chose qu’il pouvait encore sentir était l’odeur chimique de ses propres blessures. La maiden se rapprocha, poussant l’audace jusqu'à placer le bout de son bâton sur l’épaule du guerrier blessé. -Je dis seulement la vérité, prophète. Il n’y a pas de honte, en cet instant. Tu as fais tout ce que tu as pu pour arriver si loin. Talos cracha encore du sang, et glissa deux mots. La tueuse inclina la tête tandis qu’elle porta son regard sur lui. Les cheveux noir et rouge du cimier de son masque étaient enchevêtrés par la pluie, plaqué sur son masque de mort. Elle ressemblait à une naufragée, semblant crier silencieusement sous l’eau, déjà morte. -Beaucoup de tes âpres murmures demeure obscurs pour moi, dit elle. -Tu dis : Premières griffes ? C’est ça ? Son accent surnaturel luttait avec les mots. La lame lui échappa des mains, à présent trop lourde pour qu’il puisse la tenir plus longtemps. Il commença à s’allonger sur la pierre noire, baignant dans la pluie torrentielle, son armure éclatante, d’or et d’argent, brillante comme le jour ou il l’avait volé. Doucement, il tourna la tête, faisant face à son executeur.la pluie douchait le sang de son visage, dégoulinant sur ses lèvres et brulant ses yeux. Merci pour nos membres qui ne maitrisent pas le bas gothique. Certaine traduction sont un peu incertaine, je prends volontiers les critiques. Il se demanda si elle souriait toujours derrière son masque. Il était bien parti pour mourir ici.ici, dans cet endroit, sur ses genoux, au dessus des fortifications de la forteresse déserté de sa légion, le seigneur noir se mit à rire. Ni son rire, ni la tempête ne réussir à engloutir le bruit de réacteur approchant. Un vaisseau de guerre à la coque sinistrement bleu et noire apparu dans leur champ de vision. Comme il se rapprochait des fortifications, la pluie glissait sur sa coque, créant des torrents argentés. De puissantes tourelles de combat s’alignèrent dans un bruit de grincements mécanique : la plus douce des musique qu’il fut donné d’entendre au prophète. Talos riait toujours tandis que le Thunderhauk faisait du stationnaire, semblant chevaucher un nuage de brume, provoqué par sa propre chaleur. La faible lueur du cockpit dévoilait la présence de deux personnages. La maiden avait déjà bougé. Elle devint une ombre floue, dansant à travers la pluie dans une envolée de velours. Des détonations griffèrent ses pieds tandis que le Thunderhauk délivrait sa puissance de feu, faisant volée la pierre en éclat sous ses pieds en une explosion circulaire phénoménale. Un instant elle fut sur le parapet, l’instant d’après elle sembla tout simplement cesser d’exister, comme banni dans les ombres. Talos ne se remit pas sur ses pieds, incertain du résultat si il essayait. Il ferma son œil intact, le second réduit à l’état d’une orbe brulante de douleur, sentant un ennuyeux mal de crâne frapper à chaque battement de ses deux cœurs. Sa main augmentique, malgré ses joints défectueux et les lésions infligés à ses implants neuraux parvint à activer l’émetteur de son col.
-Je vais vous écouter, la prochaine fois. Couvrant le bruit plaintif des réacteurs, une voix sortit des hauts parleurs extérieurs du vaisseau de combat. Les distorsions effaçaient toutes trace d’intonation et de ton. -Je sens que vous auriez du. -Je vous avais dit de partir, je l’avais ordonné. 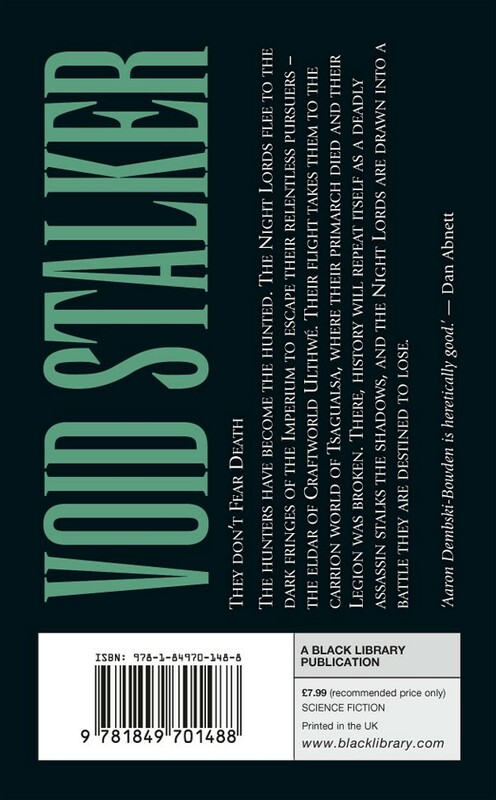 Lord of the Night reviews the breathtaking final novel of Aaron Dembski-Bowden’s acclaimed Night Lords trilogy, the novel Void Stalker. “Never before has a book resonated within me as Void Stalker has. 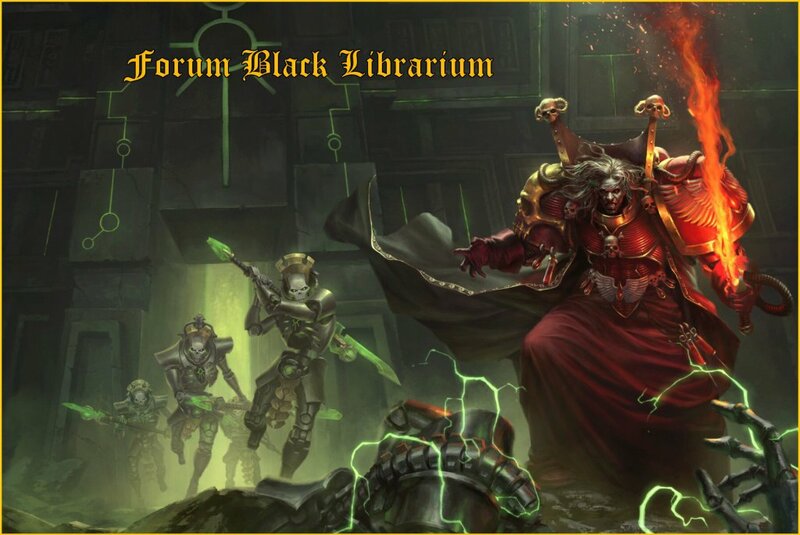 Through this rollercoaster ride of revealed secrets, whispered prophecy and epic battles Aaron Dembski-Bowden has managed to create one of Black Library’s best novels. So this one’s for him… In Midnight Clad!” - The Founding Fields. Well it finally arrived. The third and last book of the Night Lords trilogy, or perhaps another name of it could be The Story of the Prophet Talos. Void Stalker arrived yesterday in my mail and I did not start reading immediately as I have limited 360 time and I was playing Mass Effect 3. When I did sit down and start reading I finished half of the book in an afternoon. The second half I have finished today. Now for the actual reviewing part of the review, after the brief synopsis of course. The Night Lords are at the edge of the precipice. Talos, the Prophet of the Night Lords and the heir to his father’s affliction, dreads the coming future. In fire and death the Eldar will come for them, and will battle them, and will kill them. He has seen the death’s of his brothers in the ruins of a dark world. Fleeing this cruel vision the Night Lords set out towards the place they once called home, the carrion world of Tsagualsa. But not all fates can be avoided, and soon the Night Lords will face what may be their finest, and final hour as the Void Stalker prowls the night, hunting the Hunter of Souls. The story that began in Soul Hunter comes to a brilliant climax in Void Stalker as the Night Lords meet their destiny. From the epilogue of Soul Hunter we knew that something was coming for Talos, and now it has arrived. ADB has told a masterful story, weaving in romance in an unlikely place and time, tragedy between brothers and murderers, dark secrets revealed at long last, and the story of a man who hated his own Legion. Through the novel we see more and more of the story that shows what it is to be a Son of Curze, a Son of the Sunless World, and a brother of the Eighth Legion. This is a story that will have you hooked from page to page until finally it ends, and you’ll be unable to stop smiling as the final words of the novel end what is in my opinion, one of the greatest trilogies in Black Library. In Midnight Clad. He is coming for you! The characterisation improves as we see yet more of the thoughts of Talos and First Claw, their slaves Septimus and Octavia, and the brothers of the Echo of Damnation as they sail towards the final battle, what drives them towards this confrontation, and the hidden secrets and beliefs that will all be revealed. Talos has grown since the last novel, his command is steadier though not any more welcome; Cyrion is as irreverant as ever, but his darker side is presented as we see more of his corruption and learn just how deeply it runs; Xarl is still the straight man that every brother fears to face; Uzas is still the frothing maniac though by the end we learn more about the fallen warrior than the last two books combined; Mercutian has some great moments and proves to be quite heroic; And Variel the Flayer shows his loyalty and the strength of the bond between he and Talos for the events of Fryga. Septimus and Octavia’s story continues as well, and theirs is a very good one and one whose ending I liked very much, sometimes in 40k nice things do happen. The Void Stalker is one of the few new entries and I must say she impressed me, and I never saw it coming. You’ll see what I mean when you read the novel. The action is heart-pounding. All bets are off on character safety in Void Stalker. From Raptor sky duels to void-warfare to running battles and lone hunting in the darkness, Void Stalker is filled with the brutal battles that ADB and his fans, myself included, love so much. The fight scenes are coreographed amazingly as the Night Lords battle against the Eldar in every theatre of warfare possible with blade, bolter and the night as their weapons. The battle between First Claw and the Void Stalker is the highlight of the battle scenes in my opinion as it is beautifully done in its brutality and tragedy. Each battle is its own and will definitely engross you with every severed limb and every life ripped away and every bolt fired and every blade slashed. The pacing of the story is great. With 30 chapters and three epilogues over 440 pages in four parts the story advances nicely through the last book of this trilogy, keeping the reader interested the whole way through. You won’t want to put this book down, I didn’t and wouldn’t have but I can’t read when I sleep and it’d be awkward if I was reading it through biology class. The environments of the story are beautiful to picture though few in number, the dark windswept wastelands of Tsagualsa and the screaming corridors of the Echo of Damnation are the central stages for the story and both imprint themselves into the reader’s head easily. The ending is… well i’ll review all three of them. The first epilogue is quite a nice one that I felt brightened this dark story a bit, and added to the list of nice moments in 40k, an extremely short list. The second epilogue brought a smile to my face too, but for a much crueller reason. And the third epilogue, the longest of the three, was nothing short of awesome, and to a Night Lords fan like me it was the best ending possible. Three endings to a book is a hell of a thing and it was welcome for me, I hope that we see more of these kinds of epilogues in other books. For its amazing story, fascinating and engaging characters, visceral battle scenes and endings that will have any fan of the Sons of Curze cheering in midnight clad, I give Void Stalker a score of 11/10, this is a story that breaks the mould and deserves a score that breaks the scoring rank. Some will probably call me a fanboy for this scoring but after reading the last book in my favourite trilogy, I honestly do not care about that, not that I ever really did though. I admit that I am a big fan of the Night Lords but I did not allow bias to affect my scoring. I chose this score because I honestly believe that this book deserves it. Should you buy this book? The answer is YES! This is one of BL’s best. If you haven’t started reading the Night Lords trilogy then start asap. Void Stalker should be required reading for all fans of Black Library and I sincerely hope that those who have not read the Night Lords books will be swayed by this and other reviews. If you don’t like Space Marines then sadly you won’t enjoy this book, but if you don’t like Space Marines you have a pretty small selection available from Black Library. And with this the Night Lords trilogy comes to an end. It couldn’t have ended in a better way. I would like to say thank you to Mr Aaron Dembski-Bowden for creating Talos, Cyrion, Uzas, Xarl, Septimus, Octavia and all the other cast and crew of the Echo of Damnation and the Covenant of Blood and this wonderful story. I won’t gush with fanboyish squealing, simply thank you for these great books and I wish you the best in your future works which I will always look forward to. And with that, this review is over. My next review will be for C.L Werner’s Dead Winter, and then the Space Marine Battles anthology Architect of Fate both of which I cannot wait to start reading. Until next time. Finally, here is the review that should have gone up on either Tuesday or Thursday this week. This past week has thrown a bucket full of stuff at my attempts to post some thoughts about ‘Void Stalker’. I didn’t even get the job that I interviewed for yesterday. Oh well… Anyway, back to the matter at hand. The final days, of a war played out over the course of thousands of years, are coming for the Night Lord Traitor Marine Talos and his comrades. Longstanding divisions in Talos’ war band could become something far worse but that is such a common occurrence as to be beneath any Night Lord’s notice. What is a far more pressing concern is the relentless pursuit of the Night Lords by the Eldar of Craftworld Ulthwe, alien beings desperate to stop mere prophecy becoming stark reality. Before we get going here, I ought to say that I’ve been a huge fan of Aaron Dembski-Bowden’s work since I first got my hands on a copy of ‘Cadian Blood’ a few years ago. You might want to bear that in mind as you read the rest of the review. Having said that though, ‘Void Stalker’ more than deserves all the good stuff that I am about to say about it. We’re talking about a book that I couldn’t stand to be apart from for too long; even though Dembski-Bowden drops a pretty big hint about the ending (right at the beginning) I still had to see how it turned out. And you do. Dembski-Bowden leaves us in no doubt that, despite their actions, the Night Lords have been betrayed by the Imperium and left directionless by a Primarch who saw nothing but futility. If that wasn’t enough, the Night Lords cannot even trust their own kin with each and every one of them either seeking more power or slowly falling to the whims of the Ruinous Powers. Can you blame them for falling back on the one thing they were good at, lurking in the shadows and striking whenever the opportunity for terror arises. Like I said, you may not like what they do but you can get just why they do it. ‘Void Stalker’ is crammed full of moments like these with Talos’ Night Lords seeking to punish innocent settlers, of the Night Lords’ homeworld, and then using that world as a base to carry out an act of terror against the Imperium that is vast in scope. These moments are extremely well executed to say the least, both in terms of what happens on the page and how the reader is invited to observe what follows. We know something is coming and it’s not going to be pretty. The thing is though, we only know a little more than the people that the Night Lords are about to fall on and attack do. It’s always a really nasty surprise when things finally kick off and it gets nastier as Dembski-Bowden shows us just what a Traitor Legion is capable of when it takes the field. I’m talking about events on the world of Tsagualsa and Xarl’s fight with the Champion of the Genesis Chapter (I don’t know about Xarl but I felt bruised after reading that fight…). All the while this is happening though, we get to see it through the eyes of a man who is essentially human and trying to deal with a veneer of super humanity. It’s a constant struggle for Talos to use his gene enhanced abilities without them killing him and even when everything works he is essentially lost without a father figure to guide. A great choice to lead a war band brimming over with mistrust and rivalry. You would be forgiven for thinking that the rest of the Night Lords didn’t realise there was a wider war going on as they’re all trying to get one over on each other first. As a result, ‘Void Stalker’ is a novel of contrasts vying with stagnation of the humanity of the far future; the humanity at the heart of darkness and more or less eternal war. And all of that is before the Eldar arrive. Dembski-Bowden ties everything else up by those last chapters (although he leaves one massive surprise right until the very end, that one floored me) and what we’re left with is one final chance for the Night Lords to spit in their enemy’s eye before the inevitable end. Being told how things turn out, right at the beginning of the book, may take away some of the surprise but this is more than balanced out by the heroism shown in the face of what is to come. The one thing that Traitor Marines and Loyalists have in common is that they all die well. It’s awe-inspiring stuff and a tremendous way to sign off the trilogy. 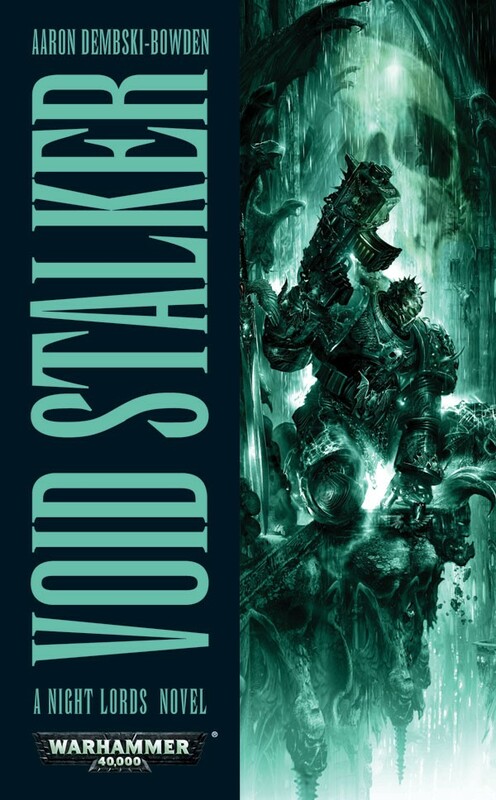 ‘Void Stalker’ is another example of not only essential Warhammer 40K fiction but also essential reading for those who like their sci-fi dark and horrific in general. If you fall into either of these camps then you really do need to pick this one up.